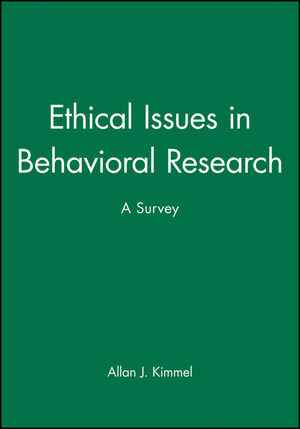 This book seeks to reflect the growing level of concern worldwide regarding the importance of ethical issues within the conduct of behavioral sciences research. Each chapter includes worldwide case studies of ethically controversial investigations which encourage students to more in-depth study. Allan J. Kimmel is Professor of Marketing at ESCP-EAP, European School of Management, France. 1. Introduction: Why Research Ethics?. 2. Ethical Principles in Behavioral Research: Professional and Governmental Guidelines. 3. Ethical Issues in the Conduct of Human Subject Research I: Laboratory Research. 4. Methodological Issues in the Use of Deception. 5. Ethical Issues in the Conduct of Human Subject Research II: Field Research. 6. Ethical Issues in the Conduct of Human Subject Research III: Applied Research. 7. Ethical Issues in the Recruitment and Selection of Research Subjects. 8. Ethical Issues in Research With Animals. 9. Ethical Review and the Communication of Results. Discusses a range of ethical studies and guidelines from the US, UK and Europe.